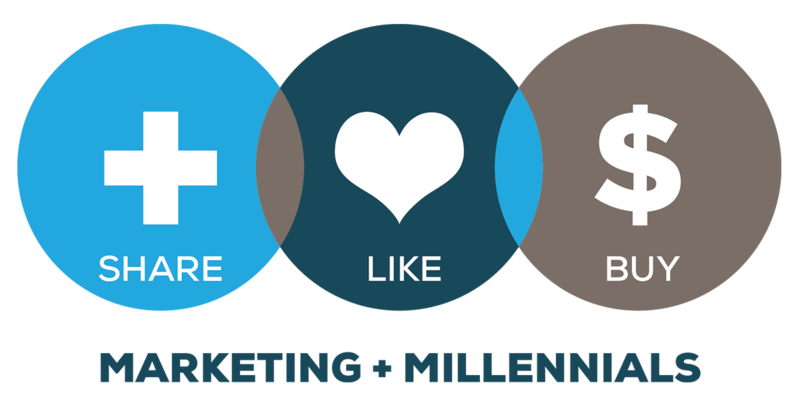 Order the Marketing to Gen Z book! Teenagers today are overwhelmingly more accepting of differences and are quick to eliminate those brands that do not foster an inclusive community. 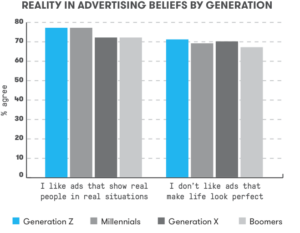 Similar to how participation defined the Millennial generation (and still does), acceptance is quickly becoming the overarching motivation for the market and consumer behavior of Pivotals. As a result, there is no expectation to be perfect. Rather than degrading others for their differences, teens today are more accepting of natural beauty and do not adhere to traditional images of perfection. to reflect a more realistic portrayal of life. This points to the Old Souls in Young Bodies concept, as Gen Z tends to be very grounded in their personal philosophy. However, that is not to say teenagers have completely outlawed the aspirational images from their news feeds. The top followed account of 2016 was Selena Gomez with 103 million followers. But, we are even starting to see a transformation within the celebrity community that is embracing a more real approach to beauty. While still participating in the glitz and glam that comes with the celebrity life, many stars are also sharing makeup-free selfies and celebrating their natural beauty before dolling up for the cameras. This is an entirely new social norm that no other generation experienced growing up. For the past 100 years, celebrities were the gold standard of perfection. That notion is being reconstructed with this generation as they are invited to see the real side of celebrity through social media. Image still matters to Pivotals. 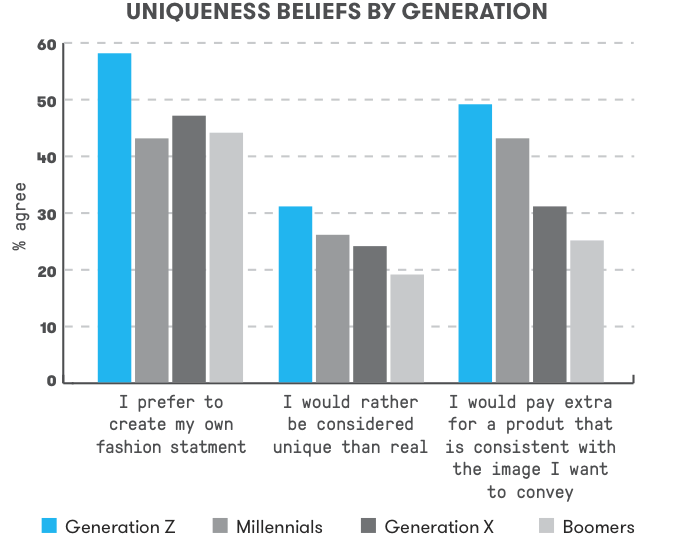 When asked how they want others to view them, nearly one third of teens told us they would rather be considered unique than real. This is a major pivot away from the Millennial generation and one of the biggest differences between the two generations. 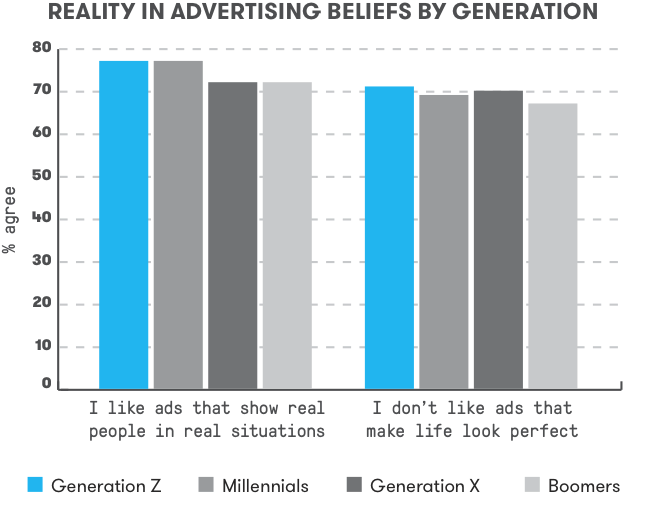 This also proves that unlike Millennials, teens have different expectations of brands than they do of themselves. Largely because of social media, the context in which Pivotals are forming their identities is entirely different than what existed for previous generations. Remember, these teens are still in high school and with that life stage comes a significant amount of pressure to present a certain image — and today that image is more public than it has ever been in the past. The tension between wanting to be unique but expecting reality from brands further emphasizes the duality this generation balances on a daily basis. Axe is the perfect example of a brand that has completely captured this mindset. For years, the Axe brand capitalized on perfectly formed models and the tagline “The Axe Effect,” which described the way women would throw themselves onto any man who used Axe products. In 2016, Axe dumped its stereotypical advertising campaign for one that is more reflective of today’s youth. The “Find Your Magic” campaign first aired in the 2016 Super Bowl with a TV spot featuring the opening tagline, “Who needs that six pack when you’ve got the nose?” The shot opened to show a close-up of a young man with an exceptionally large nose. Instead of pushing him aside or changing him, the campaign embraced his uniqueness and continued to feature other real men, effectively encouraging young men to find their own magic. To be successful, brands will need to implement programs and campaigns that embrace differences and remove the branding or logo from the feature spot. The goal must be to enhance the personal image of the consumer, not the brand, and allow them to manipulate the product or service to create whatever unique image they want to present. To get the full scope on Gen Z, The Pivotal Generation, be sure to download the full report now!